Sunday Worship: We meet on Sunday morning and evening were we worship through song, prayer, music, bible reading and of course, the preaching and explanation of God’s word. On the first Sunday of every month we have a Missionary Service in the evening and on the last Sunday of each month we have our Prayer/Care/Share service. And there is always time for a cup of tea/coffee and biscuit to talk afterwards. We run a breakfast club on a Monday morning at the Pavillion in Shankhouse. Come and join us for a sausage, egg and bacon roll with a nice wee cuppa! Our Parent and Toddler group is run in 5 sessions throughout the week. On Tuesday and Friday we offer double sessions with a single session on Wednesday. This is run at the church by Cristy. It is a safe environment for children to play, do crafts and sing. Parents and carers get a chance to talk while being able to supervise their children. On Tuesday evenings we run a prayer and bible study. Everyone is welcome to join. It is an informal conversation around God’s word in which we discuss and share. This is led by our pastoral team. Prayer is part of our Christian life and we seek, as a church, to give time to pray to God for the world, our community, church and families. Every week we meet at Costa in Cramlington to unpack Scripture together. The Bible says faith comes from hearing the word of God; so to help us grow and understand our faith we believe in opening, reading and discussing what God is saying to us and individuals and as a body. So please come and join us if you are free. The church building will be open every Thursday for a time of prayer. We believe that prayer is important and needs to be central to the life of the church. This is a place and space for everyone to come when they are free to spend time in the presence of God away from the hustle and bustle of life. Each week there will be challenging thoughts and activities to help engage our meditation and prayers to our God. This fellowship group meets on Thursday afternoons and is open to anyone who is able to come. Bring your lunch, enjoy a cup of tea/coffee and a little chat. It is about coming together, getting to know one another, not taking ourselves seriously and enjoying with one another. We open up Scripture and share what the Lord has placed on our hearts to encourage each other. They are a Worshiping Community of young and old whose aim is to build up the reign of Jesus Christ in Cramlington, working in conjunction with fellow Christians in our town. ‘We try to follow the example of Jesus Christ, caring for all God’s children throughout the world, by what we say and do in our daily lives’. Meeting in Northburn Primary School at 10.30 on a Sunday morning. St. Peter’s meets in the hall at Northburn Primary School on Horton Drive. 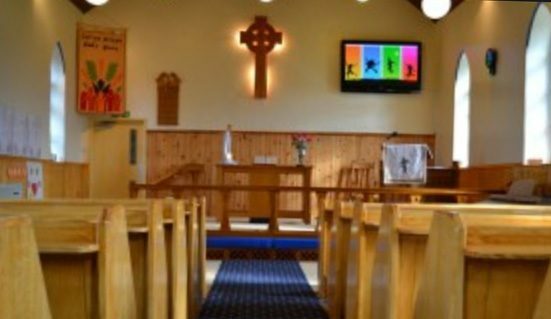 They are a small, friendly congregation, offering a warm welcome to all, including families and young children. The café church services on the first Sunday of each month are especially relaxed, with an emphasis on food and drink, craft activities and making new friends. If you haven’t been to church in a while, café church could be a good place to start. No advance notice needed – just turn up, you’ll be very welcome. St Andrew’s church meets at Beaconhill Community Centre on Langdale Drive on Sundays at 10.30am. Services are informal and are followed by refreshments. Children are welcome, and each week some fun activities are available during the service, teaching basics of the Christian faith to children 4 -12 years.